The trajectory and distribution of icebergs and ice islands is relevant to the operational mandates of the Canadian Ice Service (CIS) and the International Ice Patrol, and this information is used in turn by the shipping, fishing, tourism and offshore petroleum industries. Calving rates of tidewater glaciers and ice shelves are increasing dramatically (Mueller et al., 2008; Peterson, 2005) at a time of increased Arctic marine traffic creating an increased demand for ice hazard information. Operational models of iceberg drift and deterioration are based on a paucity of observational data from the East Coast of Canada, which may not be relevant to Arctic conditions (Bigg et al., 1997; Kubat et al., 2005; Kubat et al., 2007). Icebergs are also known to have a large influence on ocean mixing and stratification, nutrient loading and primary productivity in Antarctica (Silva et al. 2006; Smith et al. 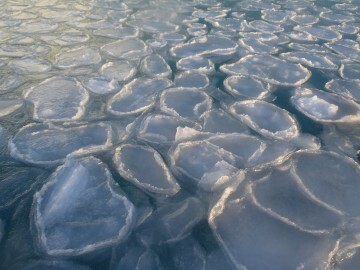 2007), however, these effects are not well studied in Arctic waters. Our pilot project aimed to record positional, mass balance and oceanographic data for a target Arctic iceberg over a 3-month period. 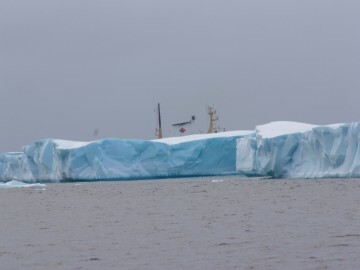 The iceberg that was targeted in July deteriorated faster than predicted and the instruments installed on it stopped transmitting as of August 27 so the sampling strategy had to be revised for October. The focus in October was to test the use of an Autonomous Underwater Vehicle (AUV) to map the underside of an iceberg to assess its future utility for better understanding mass loss processes (melt and deterioration) in this relatively inaccessible environment. 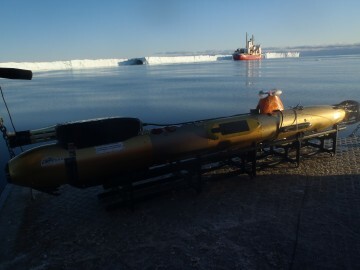 The AUV will also be used to measure conductivity, temperature, currents and chlorophyll levels surrounding the iceberg. Through collaboration with others onboard the Amundsen we will make use of the EM302 and EM3002 multibeam systems for mapping the side of the iceberg. Our environmental data will eventually be used to validate and improve iceberg drift and deterioration models. In addition we intended to track Petermann Ice Island fragments PII-Ba and PII-B and obtain baseline ground penetrating radar (GPR) thickness measurements for mass balance estimates. Our field work was divided into three phases: Phase 1) AUV engineering tests; Phase 2) PII-Ba; and Phase 3) PII-B. UBC-Gavia had not previously been deployed under a thick iceberg or ice island and this required innovations in deployment methods and AUV configuration. The AUV team analyzed mission logs from test deployments in July and developed a troubleshooting strategy to improve and optimize AUV performance for the October leg of the cruise. The AUV team took advantage of all opportunities to deploy the vehicle from the CCGS Amundsen’s barge during regularly scheduled science station, increasing time in the water which was severely limited in July. The team tested altering physical deployment methods (fine-tuning the ballasting, altering safety line attachment points, modifying surface dive initiation), hardware modifications (inversion of SwathPlus module, CTD bulkhead connector reset), firmware changes (SwathPlus harddrive disk repair) and software configuration changes (depth track error limit, depth descent rate, depth ascent rate, collision avoidance, ADCP water velocity, bottom track disabled, SwathPlus activation protocol). 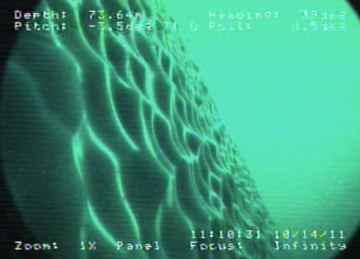 Additional sensors on the AUV were optimized (these included a Wetlabs Optical Backscatter (Chla, CDOM, turbidity) and an Imagenex Sidescan Sonar) and deployment methods from the Barge were improved (heat packs and heat gun for de-icing of sensors between deployments). Iceberg scientific operations began at Petermann Ice Island fragment PII-Ba in western Lancaster Sound on October 13 and 14th. 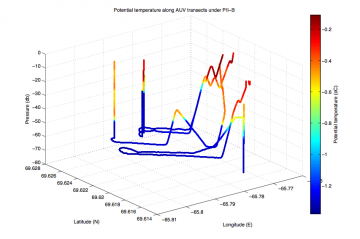 The AUV team successfully deployed the AUV on two tests missions parallel to the ice edge to a depth of 50m. The EM3002 was used to map a 500m section of the ice island wall in high resolution to analyze surface roughness. The Seamor ROV was deployed to visually inspect the ice wall surface features in order to ground-truth the EM3002 data. The AUV was successfully deployed on four approximately 500m long missions spaced 100m apart under the eastern edge of the ice island. The AUV flew at a constant depth of 60m, approximately 30 meters below the estimated depth of the ice island at its eastern edge. The EM3002 was used to map the ice island wall and seabed bathymetry along an 800 meter section overlapping the AUV transects. One SBE19+ CTD profile was obtain directly adjacent to the ice edge and a photo and video survey was completed of the ice island freeboard along this section. The performance of the UBC-Gavia AUV was greatly improved over the course of Leg3b to the extent that the vehicle conducted not just one, but 4 several hundred meter long missions under a 30-50 meter thick ice island. This is a significant accomplishment and the utility of small portable AUVs for under ice work has been proven. The deployments were not flawless, as the AUV aborted prematurely under ice on 2 of the 4 missions, and had to be recovered using the safety line, so continued testing and optimization is necessary. However, despite these challenges UBC-Gavia successfully completed these high risk missions and collected pioneering data from under an ice island. 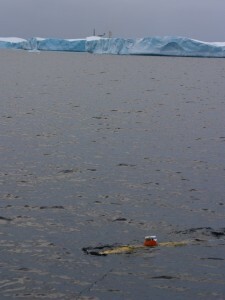 The AUV collected CTD and ADCP data along the face of the iceberg wall. The EM3002 multibeam was used to map a section of the ice island edge which shows a vertical wall extending down to approximately 75 m. The ROV survey revealed scallop features on the order of 5cm extending right down to the bottom edge of the iceberg. These indentations are likely evidence of subsurface melt. A section of the ice island and seabed was mapped with the EM3002 multibeam and the SwathPlus interferometric sonar on the AUV. The AUV also collected CTD, optical backscatter, sidescan sonar, and ADCP data along each of it 4 runs under the ice island. Bigg, G.R., Wadley, M.R., Stevens, D.P. and Johnson, J.A., 1997. 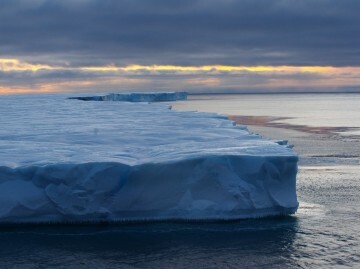 Modelling the dynamics and thermodynamics of icebergs. Cold Regions Science and Technology, 26: 113-125. Kubat, I., Sayed, M., Savage, S.B. and Carrieres, T., 2005. An operational model of iceberg drift, Proceedings of the Fifteenth (2005) International Offshore and Polar Engineering Conference, Seol, Korea, pp. 752. Kubat, I., Sayed, M., Savage, S.B., Carrieres, T. and Crocker, G., 2007. An operational iceberg deterioration model, Proceedings of the Sixteenth (2007) International Offshore and Polar Engineering Conferencnce, Lisbon, Portugal, pp. 652-657. Mueller, D.R., Copland, L., Hamilton, A. and Stern, D.R., 2008. Examining Arctic ice shelves prior to 2008 breakup. Eos, Transactions of the American Geophysical Union, 89(49): 502-503. Peterson, I.K., 2005. Large tabular icebergs and ice islands off Eastern Canada in 2001-2003 and their probable source, Proceedings of the 18th International Conference on Port and Ocean Engineering under Arctic Conditions, Ottawa, pp. 143-152. Savage, S., 2001. Aspects of Iceberg Deterioration and Drift. In: N.J. Balmforth and A. Provenzale (Editors), Geomorphological Fluid Mechanics. Lecture Notes in Physics Series. Springer-Verlag, Berlin, pp. 279–318. Silva, T.A.M., Bigg, G.R. and Nicholls, K.W., 2006. Contribution of giant icebergs to the Southern Ocean freshwater flux. Journal of Geophysical Research, 111: C03004. Smith, K.L., Jr. et al., 2007. 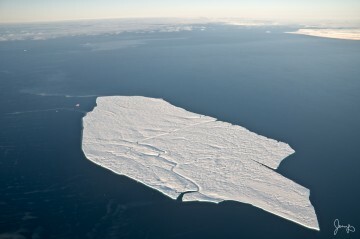 Free-Drifting Icebergs: Hot Spots of Chemical and Biological Enrichment in the Weddell Sea. Science, 317: 478-482.